Layers are cut around the sides and back of these blonde tresses to lighten the length and to enhance the bounce and movement of the waves added to the mid-lengths to ends. This fancy 'do is easy to re-create at home with the right tools and needs product for hold and shine. 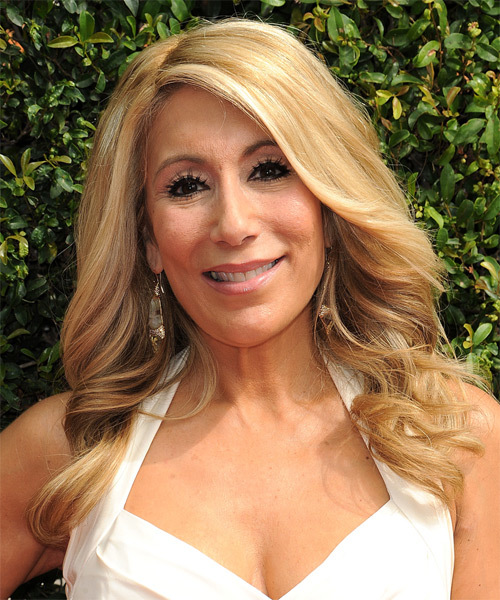 Lori Greiner looks gorgeous here in a long wavy â€˜do. This hairstyle has a Seventies feel to it, thanks to the layering around the face and the flipped out fringe area. Lori has an oblong face shape and low forehead, so the deep side part and cascading bangs work wonders for her. The curls throughout the ends give her â€˜do extra body and bounce, while volume is added at the crown area by backcombing the roots. This hairstyle gives Lori a polished look that is perfect for an evening out. As for her color, Lori is wearing a sunny blonde tone that has subtle highlights throughout. Her natural hair color is dark brown, which matches her eyes and eyebrows, plus it works with her warm complexion. Blonde is a good option for Lori as well, as long as she keeps it warm and golden. Lori Greiner is an American inventor, investor, entrepreneur, author, and television personality. She is best known as a cast member of the reality TV show Shark Tank.